Powered by a dependable Briggs & Stratton 625 Series engine, the Poulan Pro wheeled trimmer is designed for cutting taller grass and heavier brush on the perimeter of your property. Trimmer lines produce a safe alternative to blade cutting. This model has a fully adjustable cutting height and is ideal for larger acreage and landowner use. Equipped with powerful Briggs & Stratton. engine. Tough and reliable to get the job done. Take on tough weeds, grass, and overgrowth with this Black & Decker 6.5 amp 14 inch AFS Electric String Trimmer/Edger. With the edging wheel, you can put the finishing touches on the edges of your lawn around driveways, sidewalks, and flower beds. Automatic Feed Spool technology eliminates bumping for more string, and a cord retention system helps prevent accidental disconnection while working. Part of ECHO's best-in-class X Series line, the PE-2620 helps create that perfect, crisp edge for a manicured look between your lawn and sidewalk. The captive wheel mount allows for easy height adjustability and the durable aluminum debris shield has an open face for reduced clogging. The Pro Torque gear case boosts torque for powering through thick grass and dirt. 163cc Briggs & Stratton Gas High Wheel Trimmer 22 inch, PR22WT Powered by a dependable Briggs & Stratton 625 Series engine, the Poulan Pro wheeled trimmer is designed for cutting taller grass and heavier brush on the perimeter of your property. Trimmer lines produce a safe alternative to blade cutting. This model has a fully adjustable cutting height and is ideal for larger acreage and landowner use. Equipped with powerful Briggs & Stratton. engine. Tough and reliable to get the job done. 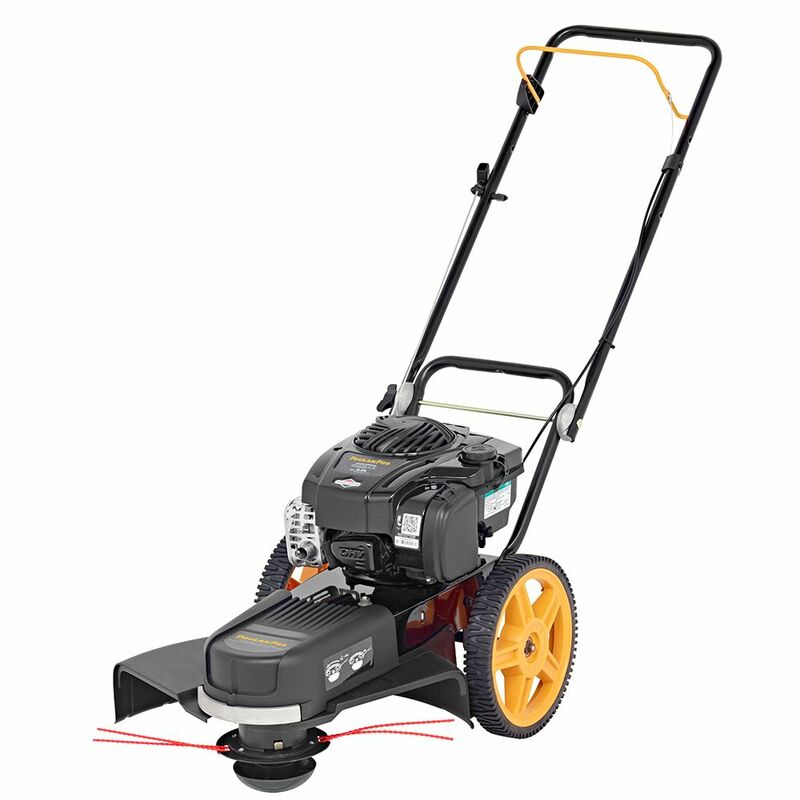 163cc Briggs & Stratton Gas High Wheel Trimmer 22 inch, PR22WT is rated 3.7 out of 5 by 3. Rated 5 out of 5 by cheefkeith from Amazing Performance....Starts with Ease This trimmer works so well, I initially thought I lost the trim cord. It cuts with such power and ease it. I highly recommend the unit. Rated 5 out of 5 by Happy Customer!!! from Outstanding product with no-fail performance! Have had this product for over 5 years and it always starts on the first pull. Only recommendation for improvement would be to add a power-assist drive similar to mowers (if/when needed or desired for terrain).